Direct connection is a way of connecting with the ScanSnap iX500 Sansan Edition without using wireless LAN settings. When you connect the Sansan Application with the Scanner through Direct connection, use the network written in the (a) area of the sticker on the scanner to connect your smartphone using Wi-Fi. When the Scanner is on, and the network written in the (a) area does not come up on the Wi-Fi screen of your smartphone, then the Scanner you are using is set to use wireless LAN. In this case, please use the access point written in the (b) area to use the scanning function. 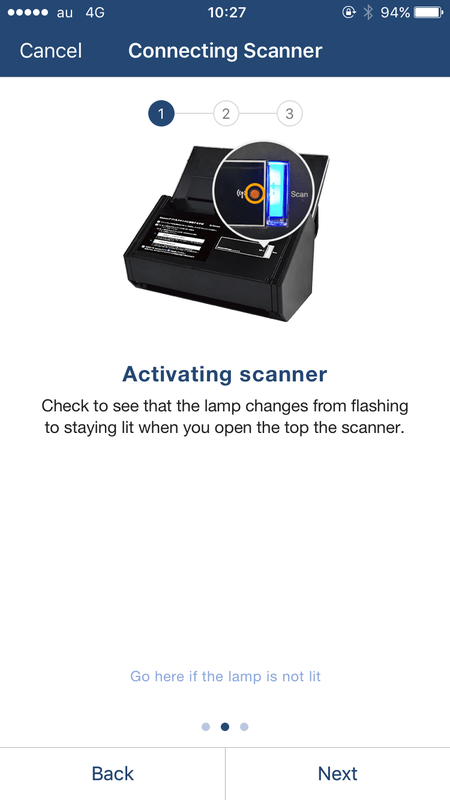 When set to connect via an access point, the lamp on the ScanSnap will be lit blue. When set for Direct connection, the lamp will be lit orange. Connecting via an access point can be done when the wireless LAN settings written in "I want to know how to connect the ScanSnap to wireless LAN" of "When you want to know more" of the "Please read this first", a document included with the ScanSnap iX500 package are complete. When you connect the Sansan Application with the Scanner via an access point, use the network written in the (b) area of the sticker on the Scanner to connect your smartphone using Wi-Fi. When the Scanner is on, and the network written in (a) comes up on the Wi-Fi screen of your smartphone, then the settings for wireless LAN for the Scanner you are using are not complete. In this case, please use the network written in the (a) area to use the scanning function with Direct connection. Or please check "Please read this first" and complete the wireless LAN settings for the Scanner. Even if the access point for the wireless LAN connection temporarily becomes unavailable, the Scanner will automatically switch to the Direct connection mode, thus not interfering with usage of the business card scanning function.